The Zen master walked up to the hot dog vendor on the street corner and said: “Make me One with everything”. The Zen master fished into his robes and handed the vendor a $5. bill. “Thank you. Please come again” said the hot dog vendor. Although I’m not clever enough to have made this up, I wanted to share it here. Thanks Roma for getting this conversation started on facebook. I opened my email to find a photo of people walking around a giant ice crevace in the ground. 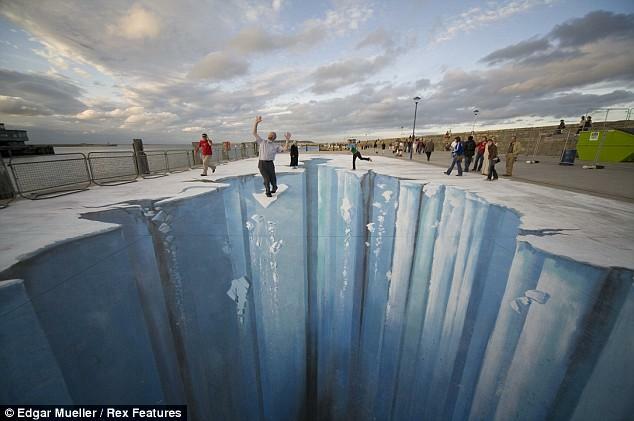 It was one of Edgar Mueller’s 3D street art illusions. I had to share this here because I got thinking that these people work for days/weeks and what he (the artist) and his assistants have to show for it is a picture or two, someone writes an article, someone blogs about it and then what? the artwork is gone? Walked all over? I checked out his website and no mention of what becomes of the scene where the pavement was used as a canvas. For me, it got me thinking – like a new meditation on the impermanence of everything. Reminded me of the sand mandalas of the Tibetan monks. What stuck with me reading some quotes of his is that his intent is to “get people to think”. He uses his talent to give us a different point of view. What we do with the information is totally up to us. Instead of feeling that after a hard day’s work, I have “nothing to show for it” as sometimes I feel doing the mundane things of everyday living, what if I approached each task as my own work of art? Not worried about having something of permanence to hold on to in the end but just have the energy I put into the task/work be a catalyst to anyone who comes in contact with it. I’m inspired by anyone who does something because they are called to do something and they hear the call. I know someone who is putting off travelling because of the increased security measures at airports. It got me thinking about whether or not I would make the same decision and postpone my trip if there was a high chance that I would have to endure a strip search. The more I thought about it, the more I was convinced that I would not change any plans to travel. The subject came up again while talking with another friend yesterday. She told me that she refuses to travel on commercial airlines. What’s your opinion about travelling by commercial planes today?